This is the story of the day that Duffy, my Greyhound, devoured two pounds of lard and became critically ill as a result. Late in the evening of December 20, 1999, my husband and I were in the process of moving to our new home when our inattention and carelessness nearly turned a joyous occasion into tragedy. In the midst of unpacking, we accidentally left our unsupervised Greyhounds with access to the kitchen and its contents, including food. Imagine our horror when we discovered that Duffy had ingested the contents of a two-pound canister of cooking lard. Our first reaction was merely concern because Duffy seemed chipper and lively enough. By December 21, he had a very large bowel movement that looked like white slime. Naively, we thought he might be able to pass the lard through his system. His appetite and mood remained steady until that night when he started vomiting and continued sporadically into the next morning. At first, the vomit was whitish and slimy, nearly indistinguishable from the previous day’s bowel contents. Again, we were hopeful that he would expunge the lard from his system from one end or the other. As December 22 wore on, and the vomiting continued, we began to realize the gravity of the situation. Although Duffy’s appetite was still strong, we dared not feed him. Within hours, Duffy was lethargic and very shaky on his feet. After 16 hours of vomiting, he had rapidly declined and was at the point of dehydration. Our veterinarian was not overly concerned until, as if to demonstrate his illness, Duffy vomited in the examination room. The veterinarian decided at that time to keep him overnight and to hook him up to intravenous (IV) fluids. On December 23, we picked Duffy up from the clinic. He had been rehydrated and the veterinarian felt that he was on his way to recovery. Armed with antibiotics and anti-nausea medicine, we happily headed home. However, with the reintroduction of a miniscule amount of bland food, the vomiting reoccurred, and continued throughout the night. We returned to the clinic on Christmas Eve. At this point, the veterinarian took abdominal x-rays to check for an intestinal obstruction or signs of bloat. Negative. The veterinarian admitted Duffy to the San Diego Animal Emergency Hospital for 24-hour treatment and observation. The tentative diagnosis was pancreatitis; Duffy was just one of five dogs suffering from the same condition at the emergency hospital. The head veterinarian told us that although Duffy was very sick, she expected a full recovery, given that Duffy remained on IV fluids and could make it 12 hours without vomiting. She also cautioned that if Duffy had permanently damaged his pancreas, he could die. Duffy required seven more days of full-time (and costly) veterinary care. On several occasions after reintroducing food, the doctors believed the vomiting was finally under control. But Duffy always experienced more nausea, and then vomiting. Frustratingly, he would make it to the brink of the magic 12-hour mark, only to relapse into vomiting. The head veterinarian’s words rang in our ears: “If Duffy has blown away his pancreas, then we can’t save him.” At nine years old, Duffy was also fighting age; senior dogs find it harder to recover than younger dogs. The longer the vomiting continued the less likely his chances for recovery and ultimately, survival. Here is information about the causes, treatment, and prevention of this serious and painful condition. Pancreatitis in its acute form usually occurs when well-meaning humans give their pet a special treat. Emergency clinics see a marked increase in cases of pancreatitis following Thanksgiving and Christmas after dogs feast on table scraps, ham, turkey, or chocolate. These delicious but fatty foods can inflame the pancreas and make the dog very sick. In dogs, the symptoms of pancreatitis include: loss of appetite, severe and frequent vomiting, diarrhea that contains blood, reluctance to walk, overall weakness, abdominal pain, and restlessness. Promptly report any episodes of severe, prolonged vomiting and diarrhea to your veterinarian so that your pet can begin treatment as soon as possible. Greyhounds, because of their sleek build, deteriorate very quickly when dehydrated. Watch closely for signs of dehydration: skin that tents up when pulled away from the scruff of the neck, dry or tacky mucous membranes (i.e., gums, eyes, and nose), and lethargy. A definitive diagnosis often requires blood work to determine enzyme levels and white blood cell count. However, no available test is completely reliable. Veterinarians can measure for elevated levels of lipase and amylase as a clue pointing to pancreatitis. The lipase test appears to the more accurate test, but it is not always available on a routine chemistry panel. Some dogs with pancreatitis do not have elevations in lipase and amylase, so even when these blood values are normal, it does not exclude the diagnosis of pancreatitis. Ultrasound can be a useful diagnostic tool, but performing an ultrasound of the pancreas can be technically difficult. Furthermore, the ultrasound might not detect abnormalities, even when acute pancreatitis is present. There is no specific treatment for pancreatitis, only a predominantly supportive approach: giving the pancreas time for its inflammation to subside while preventing further complications. Most dogs with acute pancreatitis recover in a few days, with complete rest of the gastrointestinal (GI) tract. During treatment, the dog does not receive food or water orally. When nothing is taken by mouth, the stimulus for pancreatic secretion abates, allowing the inflammation to subside. When the enzymes (lipase and amylase) return to normal levels, then the dog can drink water and eat a very low fat diet in accordance with the veterinarian’s instructions. To prevent dehydration during the period of complete bowel rest, dogs must be given fluid therapy, usually intravenously. Dogs with serious bouts of pancreatitis almost always require hospitalization. Steroids and other anti-inflammatory agents do not seem to aid recovery. Chronic pancreatitis is a condition in which the inflammation has caused irreversible changes in the microscopic structure of the pancreatic tissue. This may lead to glucose intolerance and digestive difficulties. Dogs that have frequent episodes of acute pancreatitis are then labeled as having chronic pancreatitis. Each additional incident causes further damage and deterioration. Chronic pancreatitis is debilitating, so it is important to take every effort to control the progression of the disease. Once a dog has had pancreatitis, it is susceptible to future episodes. Luckily, the most common cause of pancreatitis is preventable. Keep high fat table scraps and snacks to an absolute minimum. Allowing access to the garbage can is at the root of many pancreatitis cases. You can also prevent pancreatitis by ensuring that your Greyhound is not obese. 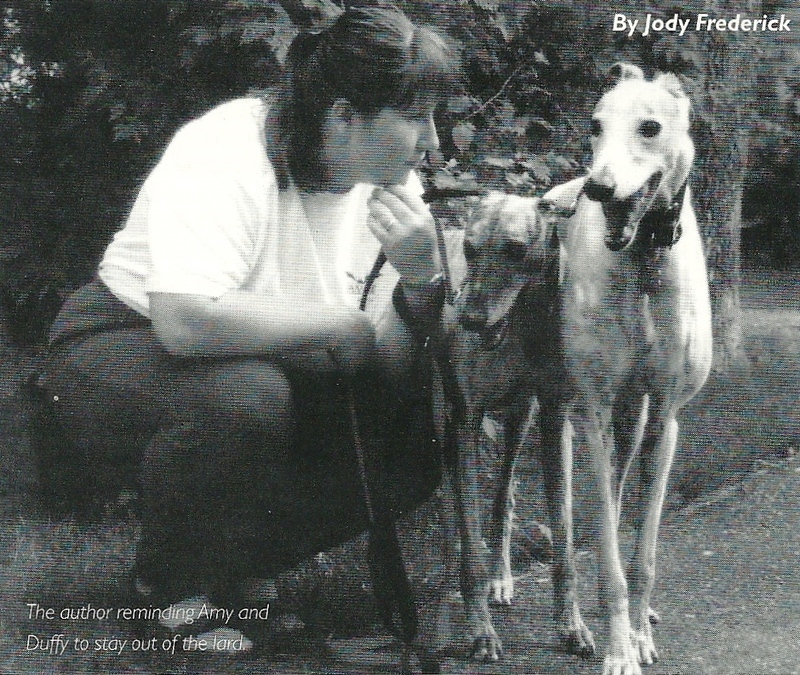 (Refer to “Hounds Battle the Bulge” in the Summer 2000 issue of Celebrating Greyhounds for information about weight maintenance). With medical intervention, luck, and intestines of steel, Duffy survived. Because he is more prone to another bout of pancreatitis, we restrict him to dog food and low fat treats, just to be safe. Despite his brush with death and a loss of ten pounds, Duffy has more vigor and attacks every meal as if it were his last. I am certain that he would gladly wolf down more baking supplies if given the chance. To prevent that from happening, we initiated a cold war of sorts: Duffy is separated from his beloved kitchen with an ex-pen iron curtain. An ounce of prevention, in his case, is two greasy, fat-laden pounds of cure. Katherine James. Pancreatitis (inflammation of the pancreas) Part 1. http://www.suite101.com/article.cfm/veterinary_info/3980. December 30, 1997. Katherine James. Pancreatitis Part 2 . http://www.suite101.com/article.cfm/veterinary_info/4856. January 19, 1998.